Actor, rapper and author LL Cool J stopped by "The Early Show" to talk about his new show, "NCIS: Los Angeles," which premieres Tuesday night on CBS. LL Cool J, who plays Special Agent Sam Hanna, a former U.S. Navy SEAL who has seen action in both Afghanistan and Iraq, and a surveillance expert who uses state of the art monitoring equipment to look out for those in the field and feed them crucial information. LL Cool J is opposite Chris O'Donnell, who plays a chameleon agent "G" Callen, who transforms himself into whomever he needs to be to infiltrate the criminal underworld. "Early Show" co-anchor Harry Smith commented that the chemistry between the characters seems almost like a "bromance." "Well, we do get along," LL Cool J said. "We have great chemistry. It's kind of like that Midwest meets that urban inner-city thing. And it really works. We gel well together and we've been having a lot of fun, and I hope as the season progresses we can have that same kind of chemistry that the original guys have." But that "macho" element isn't what the series is about entirely, according to the actor. He said, "There's a lot of macho in (the show), but there's Linda Hunt, as well, and Linda is phenomenal, and she has an Academy Award, and that's real macho. ... There's a nice balance. There's heart in the show, as well." LL Cool J is no novice to acting. He has appeared in more than 30 films. He's also been seen on the Fox hit show "House." Recently, he also guest-starred on "30 Rock" as hip hop mogul Ridiculous. The star said he "caught the bug." "I really wanted to act. And I wanted it act to act on a regular basis and challenge myself and experience something new in my life," he said. "And part of that process is thought continuing to do the same things that you've always done. So I decided to commit to the show, commit to what I thought was a great team. I believe in the 'NCIS' brand, and hopefully people enjoy the show." Smith remarked what draws people to the "NCIS" shows are the characters. LL Cool J agreed, saying, "It is a procedural, so there are some things in it that are kind of like, formulaic, but there's a character element to it that takes it to another level." However, there are a few things that the actor doesn't know about his character yet. He said, "We're as much in the dark as the public because you find out as the show goes on." 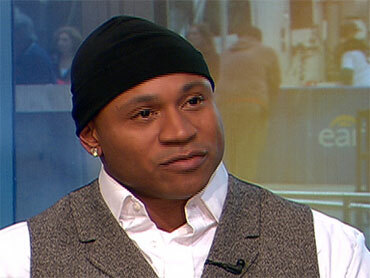 LL Cool J has bundled his rapping talents with the show. The two-time Grammy award winner just released a new song, titled "NCIS: No Crew Is Superior The Rap Song." It was recorded for LL Cool J's Label Boomdizzle, and is now available on iTunes. LL Cool J will star in the series premiere of "NCIS: Los Angeles" Tuesday night at 9:00/8:00 Central on CBS.